Anaya, the renowned New Age/Relaxation/Meditation Composer and Producer, Shares a Blissful Journey Through Poetic Soundscapes in New Album, Eternity. Our best instrument is the universal harmony of being. After receiving a widely-loving response from the release of her single “Dharma,” Brazilian artist Anaya released her anticipated new album, Eternity, worldwide. In the process of bringing her musical vision to life, the multi-talented composer/producer experienced her childhood dream of playing alongside a live symphony orchestra. The unique production featured a virtual collaboration and real time recording in cyberspace between the artist’s label AnayaMusic in Brazil, a live symphony orchestra in Prague, and Steve Salani at Orchestra.net Studios in Los Angeles. Anaya's hope is that the lush-sounding orchestra will soothe listeners as well as appeal to her peers; she has submitted it for consideration in New Age for the 59th Grammy® Awards. In depth information about Anaya, Eternity and her other music can be found at AnayaMusic. The making of Eternity was as harmonious as the music itself. Fine global musicianship and innovative technology enabled Anaya – who also holds a PhD in Information Technologies -- to live out her life’s dream to record her music with an orchestra. Salani and Orchestra.net Studios focus on live orchestra production, bringing warmth, depth, and emotion to Anaya’s soothing musical style; the symphony combines members of the finest ensembles in Prague, including the Czech Philharmonic. Anaya and Salani composed and arranged a majority of the tracks together, recorded them with the symphony, and had the project mastered by Matthew Shell at Sweet Spot Studio in Annandale, VA. 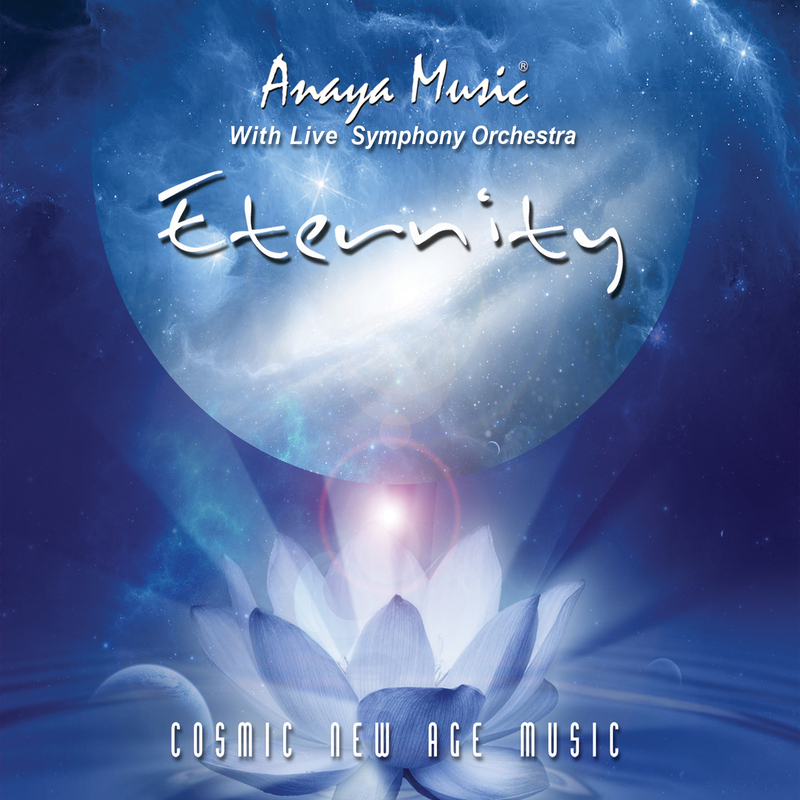 The result, Anaya says, is that “Eternity” becomes a harmonious, uplifting passage into the soul of music, playing the symphony of the universe. “The essence of Love is Eternity. Love transcends time. Beyond memories of a beginning and fear of an end our immortal soul symbolizes love and Eternal life. Music becomes a gateway to the realization and integration of our deepest feelings of love, grief, fear, joy and peace,” says the artist, who refers to this album as Cosmic New Age Music, reflected in her music videos with images of outer space. Ethereal album packaging illustrated with light, spheres, lotus flowers and elements of space set in deep blues and purple conveys the message that this is modern new age music. The songs are carefully sequenced for those seeking a relaxing spiritual journey through music. The album opens with “Dharma,” a warm, gentle track with a celestial feel, inviting the listener to prepare to go deeper. “For Love” truly demonstrates the difference in quality with a live symphony as opposed to electronic tracks; the orchestration adds depth while freeing the heart-based music to soar with a universal feeling. “Gaia” is a track that beautifully weaves natural bird song into the music, giving it an earthy, grounded feeling for the Mother. There are seven songs in all. 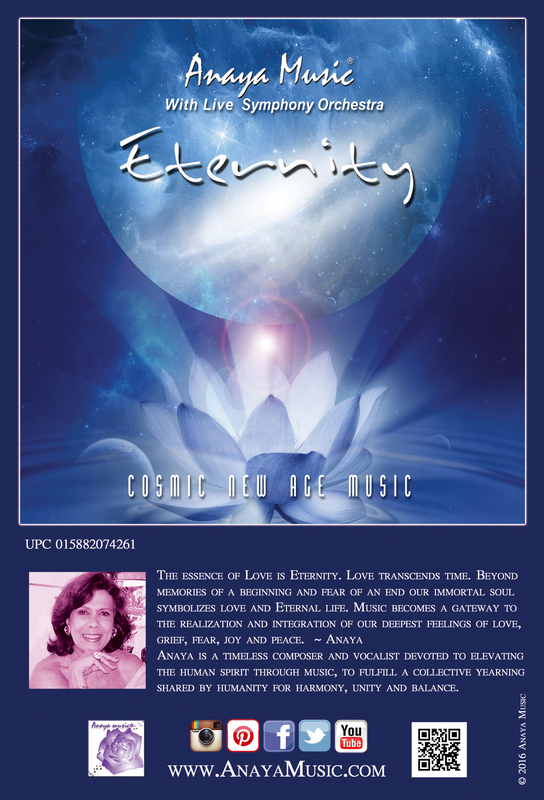 New Age music writer Michael Diamond shares, "While I have heard and enjoyed Anaya’s previous keyboard-based albums, her new release, Eternity, in collaboration with a live symphony orchestra, brings out the richness and dimension of her stirring compositions, taking her music to another level altogether. Anaya’s desire to elevate the human spirit is deeply felt in every note of this inspired recording." Over the course of her career, which includes the albums Fifth Essence (2015), Devotion (2014) and Aligned in the Universe (2013), the Brazilian-born-and-raised Anaya has passionately expressed her spirituality and the influence of her cultural roots through music, art and poetry. Her unique style captures the soothing, inspiring and energizing essence of Brazilian music, delivering a dynamic synthesis of new age, electronic and melodic trance influences and textures. Her expansive vision – also reflected in her YouTube videos -- is translating to an increasing following in North America and Europe. Anaya shares that music heals not only the listener, but the composer, too. "I was finishing the album Devotion in 2014 when my husband died; I had to go way beyond my strength to transcend. I began composing Fifth Essence and recorded 'The New Journey' in tears, but afterward came the song 'Aonki' which means the gate between the galaxy and the universe. 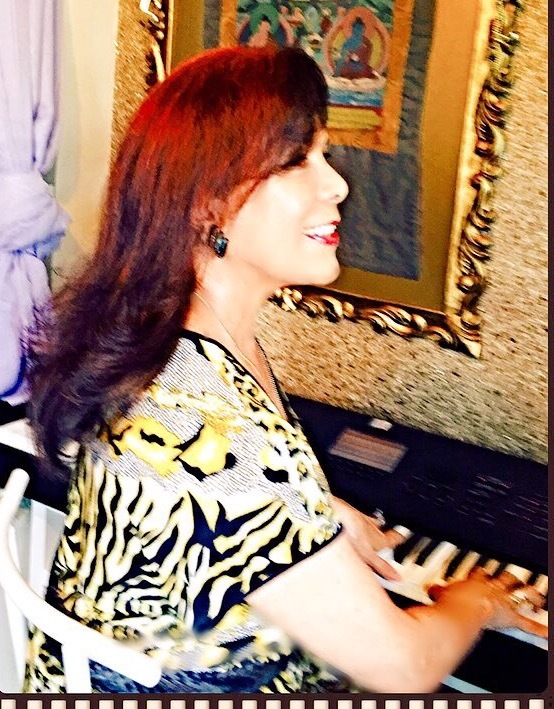 I continued healing, and eventually happiness flowed through with the song 'In Love.'" The complete AnayaMusic catalog is available via Anaya’s website, online music stores and in select retail stores; please see links below. For additional information or requests, please contact AnayaMusic at anayamusic(at)terra.com.br. Radio airplay and media is being managed by: Ed & Stacey Bonk at LAZZpromotions(at)Rogers(dot)com. Mainstream retail distribution is handled by CPI Distribution, claypinc(at)cs(dot)com, or 440-333-2208, and for specialty store retailers by New Leaf Distributing at 800-326-2665. Anaya is a timeless composer and vocalist devoted to elevating the human spirit through music, to fulfill a collective yearning shared by humanity for harmony, unity and balance. Anaya’s desire to learn the universal language of music emerged when she was 4 years old reared by a rich culture driven by music and the arts. Her musical journey began on guitar and piano, which led to many years of dedication to composing and producing her own albums. Anaya is a multi-talented professional with a Post Doctorate degree in leadership and a PhD in Information Technologies. She has a very unique international resume, which includes traveling the world as a performer of Brazilian pop music and working for the University of Brazil and the United Nations as an Information System Specialist. Anaya weaves her expertise in computer science with a deep understanding of universal spirituality to create a union between technology and the senses, which becomes the heart of her work. 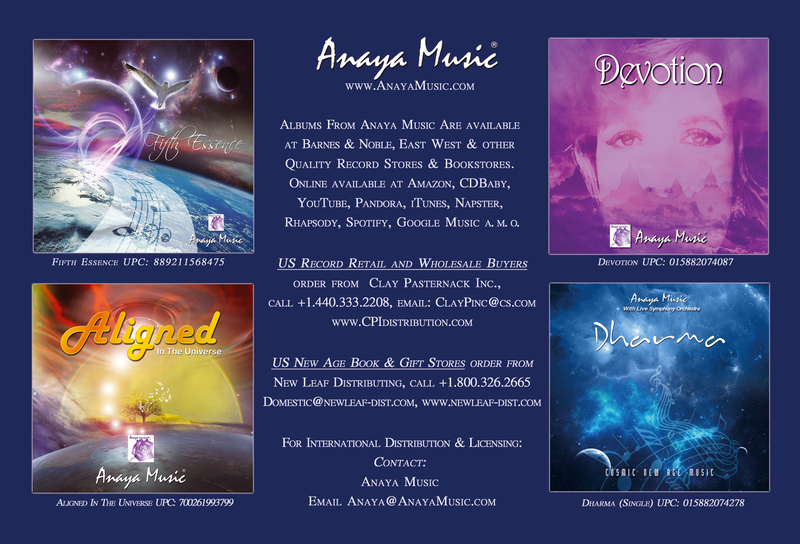 AnayaMusic is her independent record label. Composer/Producer Anaya of AnayaMusic Eternity by AnayaMusic: submitted to the 59th GRAMMY(R) Awards in the New Age category. Additional albums by AnayaMusic Promotional poster for Eternity. AnayaMusic Logo Anaya at the keyboard.